Is it possible to be one of the more influential acts of the ‘90s while only releasing three records? Moreover, what if one of those albums came out posthumously after the lead singer’s tragic passing? The 17 million albums sold worldwide would say it is—and their cult following, in spite of breaking up nearly 20 years ago, seems to have cemented their legacy. Eric Wilson and Bud Gaugh were childhood friends growing up in the same Long Beach neighborhood. In the late-‘80s they formed a three-piece band called The Juice Bros with another friend who’d end up being their future manager. 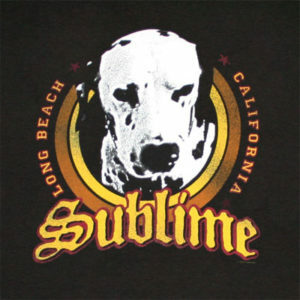 Right around the same time, a fella named Bradley Nowell dropped out of UC-Santa Cruz looking for a music opportunity. The two sides met, it was an instant lovefest. While Wilson and Gaugh’s previous influence was mainly punk rock, Nowell introduced the others to reggae and ska music. They would name their new band Sublime, and play their first gig on July 4th of ‘88. Because of their eclectic fusion of rock and reggae and punk, no one wanted to book the startup band. In response, Sublime created their own record label and released a few demos on it to look more official. The tactic worked, and they began booking shows all around Southern California with future hit bands like No Doubt. After releasing two studio albums on their own label, the band felt poised to truly breakout. After headlining a major music tour, they began recording their Self-Titled third record and signed a deal with MCA to release it. They wrapped sometime in late April 1996, with lead singer Nowell passing away of a heroin overdose on May 25th of the same year. Despite no real marketing, the album would sell millions of copies the first few months. You’ll see it on various top album lists of the ‘90s and of alt-rock in general. Sublime is credited with ushering in the ska movement of the decade, paving the way for many other rock acts featuring horns and blending the styles. It’s hard to listen to this and not find a handful of songs you want to play again. It’s clear the influences are rock, hip hop and reggae—but with an incredible blend of SoCal laid-back surf rock. The result is a totally unique take often referred to as ska punk, a genre created by Sublime. L.A. rock station KROQ has listed Sublime as their third greatest band of all time for the last decade plus. And, like Nirvana, the Sublime sound and legacy has continued through generations, in spite of no new content or effort to promote the band. What I love most is the singles you continue to hear today, may not even by my favorite tracks. A song like “What I Got” is an absolute classic, and it may not make my Top 3 – top to bottom, the record is simply that good. Sadly, heroin was such a mainstream drug at the time in the music culture, and took too many too soon. Sublime was all about being rebellious, but also a real-life view of what growing up in Southern California was all about in their experience. Their candid take of culture and lifestyle makes for great songwriting, and in combination with their sound, makes this a $5 dollar must-have. Happy listening! Editor’s note: In the spirit of full disclosure and transparency, know that some songs on this album have explicit lyrics—but not all.